Two more readers have decided to permanently mark their bodies to show how much they love gaming (and wearing sleeves for job interviews). 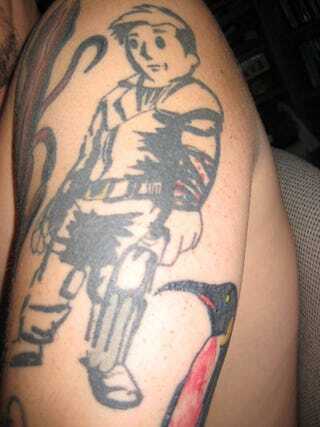 The first — Jim Osterhout — had his Fallout tat done back in 2005. A stylish, almost calligraphic, Vault Boy in black ink with yellow and red highlights (and a bonus penguin). Jim informs us that he has taken to telling non-gamers that it is a picture of him. Secondly, Adam Zweig sent pics of his impressive, full-color sleeve tattoo featuring "Sonic, Shy-Guys, Paper Mario, Poe, Ghoul, Nel from Star Ocean, C&C Renegade Dead 6 Logo". Bet that hurt. Weirdly, both pics arrived in my inbox within ten minutes of one another. Is this what it is like being Warren Ellis? Are you lot going to start sending in Polaroids of your video-game-themed genital modifications now? Thank you, no.